Home and Commercial Property Inspectors! Cradle to grave support since 1995!!! Your personal building consultants for life offer a 90 day Home Warranty and Appliance Recall Check. Trees Can Be Beautiful - And Hazardous! It's spring! It's spring! It's spring! FINALLY!!! Municipal by-laws protect trees against wilful damage, removal, construction collateral damage and the like, but what protects the homeowner from the trees? What does a homeowner need protection from? Growth - Trees grow and grow and grow. Are the branches overhanging the roof? This is tricky. The bigger the tree, the bigger the potential damage. Solution - get the tree evaluated by a tree company to determine health. Are the branches overhanging or touching power or phone lines? Solution - call the utility company for an opinion. Are they near a foundation and can they push on it? Solution - remove it but you may need a permit. Are they pushing up a drive or walkway from below? Solution - you are going to have to re-do the drive or walkway and you can't damage the tree - it's tricky! Roots can infiltrate weeping tile and sewage drain pipes. Solution - consider a camera inspection of your drain lines if the house is older and the trees are bigger. Note: This happened to me - In our 1st year in our 1920s house, we had a plugged drain line and I had to have the sewer partially replaced and relined to the street for about $2000. Murphy's Law being what it is, it was 3 days before our big Thanksgiving dinner, but we got it fixed in time to have our plumbing active for the big feast! Tree roots were the culprit!!! Decay - Older trees rot and ants can nest in them, not to mention termites in some areas. I have seen trees come down that were rotted through, with holes filled by concrete (so we know they were previously evaluated). Often the damage or rot is very high up the trunk in some Y-shaped branches. Solution - get the tree evaluated by a tree company to determine health. Keep that receipt for your records in case of a future insurance claim to prove your due diligence. Take a look at this tree that fell and look at the height relative to the fence, poles and cars. Fortunately this tree fell into the street and killed only a car. A good home inspector looks for signs of rot or damage, and will at least mention them to you. He/she should also discuss the plumbing issues. Remember though, an inspection is visual and essentially limited to what can be seen! Get a good firm grasp of the health of your large trees by hiring a tree service to give you a report. Consider a camera inspection of the drain lines, a nominal cost that can include cutting out roots in the pipes. You can't buy 100 watt incandescent bulbs anymore, so what do you do? We are being encouraged to use #CFLs (Compact Florescent bulbs), but you should know that you are bringing a toxic hazard into your home. 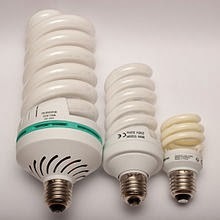 CFLs use 20-30% less power and last 10X longer than regular bulbs - but they contain mercury! So now you need to know a whole bunch of safety stuff about these bulbs. For example, if one breaks, you need to know #howtocleanupabrokenCFL. First you need to clear everyone out of the room to let the dust settle, turn off your furnace or air conditioner, use a wet cloth or sticky tape to clean up the settled mercury dust, dispose of it in a sealed container and you must always take a CFL to the toxic waste dump! Oh, and DO NOT USE a vacuum. Yay - wasn't that fun? Turning CFLs on and off frequently shortens their life span. They are less effective in cold environments, like garages or porch lights in the winter. When installing (or removing) a CFL, only turn the plastic base, not the glass. As they age, they overheat, so if they are mounted upside down, you may get a burning smell (jury is out on whether they are a #firehazard - I say yes). As a #homeinspector, I wonder about mercury residue in the future within homes. You will never know if there was a toxic situation because of a broken bulb and careless handling. Mercury is a potent neurotoxin, and it's especially dangerous for children and fetuses. I know you can't worry about everything, but it is food for thought. Well LEDs are more expensive, and also should be disposed of in a toxic dump. Cheaper bulbs are not as reliable, bright or long-lasting. The light is directional. Those are the negatives. On the bright side (pun intended), they also last much longer and generate very little heat. Modern LEDs are much brighter and more consistent, but an inferior bulb can fail more quickly and isn't as bright - stick with the name brands. Also, look for one whose packaging says it is dimmable. These lights are also "instant-on", unlike CFLs which need to warm up. However, an LED GU10 type bulb (typically used in pot-lights) that replace halogen bulbs, are so worth it. A 50 watt LED uses only about 8 watts of power (that's 16% of the power usage). I once measured the power consumption of a kitchen circuit with 6 halogen potlights turned on and it was the biggest power draw of any of the circuits in the house at the time. Our home and building inspections cover issues found on the day of inspection, but we do like to give you maintenance tips for the future. If you have any questions, feel free to contact us (advice and support are free). 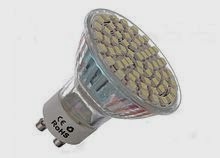 Look for high quality LED bulbs as a replacement for incandescent bulbs. How Good is That Washer Hose? How old are the hoses supplying your washing machine? Your dishwasher? Your fridge's icemaker? Your toilets? You say, "It doesn't matter - they have a metallic cloth wrap. They are burst-proof!" Not so fast, I say. The hoses may be burst proof, but what about the ends or fittings? And the fridge ice maker? If it is a clear plastic line, then dump it immediately in favour of a copper tube line (braided steel hoses are available for fridge ice makers, but solid copper tubing is better by far). As a matter of fact, an appliance repair technician told me that the plastic lines are famous in the industry for cracking when older than 5 years. When you go on vacation, it never hurts to shut off the washer hose valves or the dishwasher valve. Same goes for the toilets if you want. When you shut off any valves, check back in a few minutes to make sure they aren't dripping. A valve that hasn't exercised in a few years is way more likely to drip. Also, when you go away, check with your insurance company to see what their policy is - they may want someone to check in on the house every 4 or 5 days to maintain coverage. Our home and building inspections cover issues such as leaks on the day of inspection, but we do like to give you some maintenance tips for the future. If you have any questions, feel free to contact us (advice and support are free). Replace any flexible water connection lines/hoses that are older than 5 years. If you are not sure, assume they are older and replace them. WETT is the Wood Energy Technology Transfer organization that provides training for inspections. Wood Stoves - Insurance companies want them WETT Inspected. A Level I inspection, which is a "Readily Accessible" inspection) will suffice (WETT Inspection Levels chart). This particular condo had manufactured wood fireplaces with shared flues. This is no longer allowed and annual inspections should be set up by the condo corporation. There may be a capital cost and associated cost outlay to the condo owners if improvements or repairs are needed. I inspected a house a few years ago that had a stainless steel chimney attached to the wood stove. The chimney had 1" insulated walls, and the insurance company would not provide coverage unless the chimney was replaced so it was stainless steel with 2" thick insulated walls. $2000 - ouch! The owner ended up just removing the wood stove and chimney - it was cheaper. Condo owners in a particular condo complex with manufactured wood fireplaces were required to have annual inspections done on their flues by the local fire department after a fire in a unit. So inspection doors were installed in walls and the condo owners bore the cost of inspections. A good home inspector looks for signs of previous inspection (access doors) and advise potential buyers of the various scenarios. You don't want to be blindsided by these costs.